The rotator cuff, which is a combination of four muscles and tendons tasked with holding your upper arm bone (humerus) securely in the shoulder socket, can become injured or degenerate over time, typically resulting in pain, stiffness, and limited function. A bicep tendon rupture often occurs in a similar manner, from injury or overuse, and can also cause significant discomfort. In many cases, both of these conditions may begin with the tissue fraying slowly before eventually tearing or as an acute incident resulting in a full or partial tear. Additionally, both of these conditions can make brushing your hair, putting on clothing, and performing other necessary movements difficult or impossible. To help you reduce pain and heal tendon tears properly, our skilled orthopaedic surgeons will develop a customized treatment plan tailored to your condition, unique anatomical needs, and lifestyle activities. If you have additional questions about either rotator cuff tears or bicep tendon rupture, or if you believe you may have one or both of these conditions, please contact us today for more information or to schedule a consultation with one of our board-certified physicians. While both conditions occur in the same general area, the symptoms of each concern are unique. 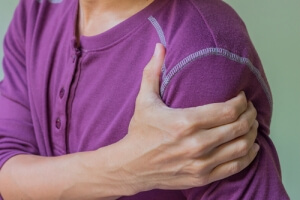 In the event of an acute injury, a bicep tear will typically present with a sudden, sharp pain in the upper arm, which may be accompanied by a popping or snapping sound. With gradual wear and tear, you may feel cramping, pain, and/or tenderness in the bicep muscle when performing demanding actions. You may also feel weakness or have difficulty turning your palm face up or face down. As for rotator cuff tears, if you injure the arm suddenly, immediate intense pain is common, along with the sound of a pop or snap. Your arm will feel weak and sore, and you will have difficulty and discomfort when lifting the arm or completing certain actions. With overuse, pain typically occurs at night and when at rest, as well as when you lift or lower your arm. You may hear a crackling or grating sensation, medically referred to as crepitus, when moving the arm a certain way. Over the counter medication can help to ease pain symptoms initially for both bicep tendon rupture and rotator cuff tear; however, side effects will likely persist and may worsen without treatment or if you continue to use your arm. Non-surgical modalities, such as rest, physical therapy, and anti-inflammatory medication, can offer a multitude of benefits, including improving function and relieving pain. Shoulder and bicep strength recovery, however, typically requires surgery. You should discuss your job duties, lifestyle habits, and treatment preferences with our physicians to determine the best method for your needs. In many cases, surgical intervention may not be necessary. In the event you have a large tear, significant arm and shoulder weakness, or conservative methods prove ineffective, a minimally invasive surgical procedure may be able to help. We utilize the most advanced techniques available, which can help to reduce recovery time, reduce the risk of complications, and speed healing as compared with an open operation. During your consultation process, your orthopaedic surgeon will discuss all available options with you and develop a plan that best suits your needs and goals. For more information about treatment of bicep tendon ruptures and rotator cuff tears, or if you would like to schedule a consultation with one of our orthopaedic surgeons, please contact our office today.